N.B. : (1) Washington Times title: "Cyprus rides a troubled sea of oil and gas opportunity." (2) I use Grammarly for proofreading because every time you publish a typo, the errorists win! The Republic of Cyprus has entered the maelstrom of the world's most volatile region thanks to new-found gas and oil reserves combined with an erratic Turkish foreign policy and a civil war in Syria. Even as leaders of this Mediterranean island show skill dealing with these novel threats and opportunities, they need support from a strong U.S. Navy, something not now available. Cypriot underwater gas and oil discoveries follow directly on ones found earlier in Israeli seas, located adjacent to them and uncovered by the same American (Noble) and Israeli (Delek, Avner) companies. The current estimate of 5 trillion cubic feet (tcf) as well as some oil has a value estimated at US$800 billion, a huge sum amount for a small country whose current GDP is a mere $24 billion. The great majority of this energy will likely be exported to Turkey or Europe. A pipeline to Turkey would be cheapest and easiest but so long as Turkish troops continue to occupy 36 percent of Cyprus, this will not happen. A recent court decision permitting the Israeli government to decide what quantities of energy to export now offers other possibilities: Cyprus could swap gas with Israel that then goes to Turkey or the two allies could jointly build a liquefied natural gas terminal in Cyprus. 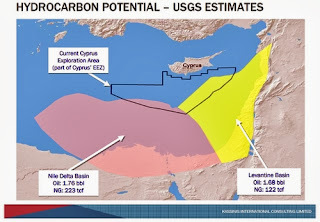 Eventually, should Egypt, Gaza, Lebanon, and Syria find gas and join the modern world, they too could take part, turning the area between Egypt and Cyprus into a truly major resource; according to the U.S. Geological Survey, the contiguous Nile Delta and Levantine basins together contain an estimated 345 tcf of natural gas and 3.44 billion barrels of oil. Erdoğan and Foreign Minister Ahmet Davutoğlu have pursued an ambitious foreign policy of "zero problems with neighbors" which, ironically, has led instead to zero friends. Strained relations with Georgia, Armenia, Azerbaijan, Iran, Iraq, Syria, Israel, the Palestinian Authority, Saudi Arabia, Egypt, and Serbiaraise the prospect of Ankara reverting to an older Turkish pattern and lashing out at Cyprus and Greece. In both cases, for instance, it could encourage disruptive refugee flows. This is where the brutal civil war underway in Syria, just 70 miles (110 km) away, enters the equation. 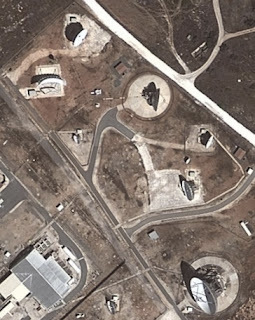 So far, that conflict has not had a major impact on Cyprus, but the island's proximity, its minimal defense capabilities, and its membership in the European Union (meaning, an illegal immigrant setting foot on Cyprus is close to reaching Germany or France) make it exceedingly vulnerable. 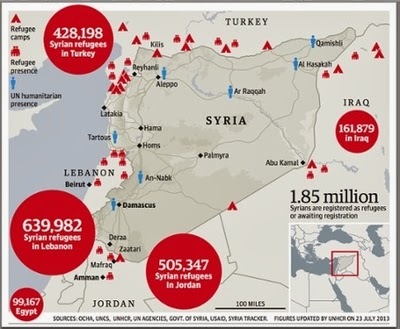 The 2.2 million refugees from Syria since 2011 have so far bypassed Cyprus in favor of (in descending order) Lebanon, Jordan, Turkey, Egypt, and Iraq, but that could quickly change if the Alawites living closest to Cyprus take to the sea in sizeable numbers. 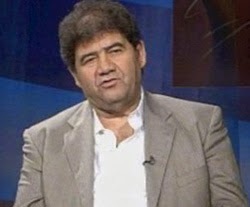 Or if Ankara encourages Syrians to emigrate to northern Cyprus and then to sneak across the border into the republic. 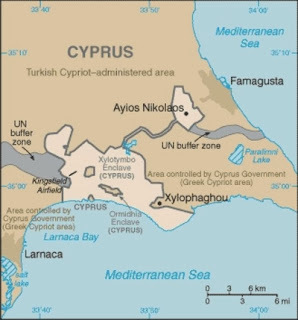 Unlike nearby Israel, which is also surrounded, Cyprus lacks either a military option or protective fences: the personnel of the Turkish armed forces, about 700,000, approximate the size of the entire population in the Republic of Cyprus, about 850,000. Put differently, Turkey's population outnumbers that of Cyprus by nearly 100 times. 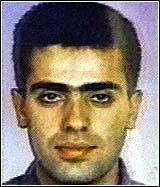 But Nicosia can create alliances, especially with Israel, to enhance its security. Israel in turn gains, by combined gas operations, strategic depth for its air force, and a diplomatic friend. As an aide to Cyprus' President Nicos Anastasiades told me, "We are Israel's ambassador in the European Union." So far, so good. But the United States Navy has been hollowed out in the Mediterranean Sea to the point that Seth Cropsey, a former navy official, describes the 6th Fleet as just a command ship in Italy and a few ballistic missile destroyers in Spain. This force needs urgently to be revitalized to support America's Levantine allies as tensions further heighten in their immediate region. Technorati Tag: Israel and Cyprus and Turkey.